Using microchips for identification of animals has been in use for around 20 years. While it has been used extensively to identify dogs and cats, its acceptance in the horse community has been slow. This has changed since Hurricane Katrina hit Louisiana. Since 1994, in the state of Louisiana, all horses receiving a Coggins test must be permanently identified by microchip, brand or tattoo. Because of this practice, most horses in Louisiana have a microchip. After Katrina, 364 horses were rescued or recovered from the flood waters. Of these, 363 were reunited with their owners. As any rescue organization will tell you, this is an amazingly high percentage. The microchip is a small device about the size of a piece of long grain rice. It consists of a small transmitter embedded in medical grade glass, sterilized and packaged. It is injected into the horse’s neck through a needle just like a vaccination. You can’t see or feel any change at the injection site. To identify the horse, an electronic reader is passed over the neck and a 10 or 15 digit number instantly appears on the reader’s screen. The microchips are biologically inert and do not have any electrical activity until interaction with the reader. They are guaranteed to function for 25 years (and that is only because there are no chips more than 25 years old, so longevity testing is still ongoing). The identification number is registered with an international database. A veterinarian, police officer or rescue organization can call the registration company any time of the day or night and, by giving the ID number, learn the name of the owner as well as contact information. The owner can also designate a backup person to contact in case the owner can’t be reached immediately. The registration company can also provide owners with certificates containing information about the owner, horse and chip number, as well as signs that can be posted around a barn notifying would-be thieves that the horses have been microchipped. There is even a place on the Coggins certificate for the microchip number, further establishing the link between owner and horse. 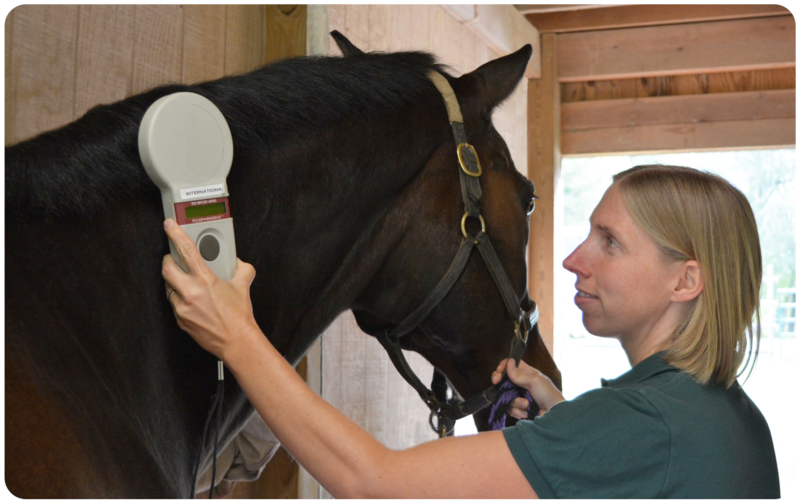 Also, beginning on January 1, 2013, the Federation Equestre Internationale (FEI) will require microchipping of all newly registered horses in order to show in an FEI event. More than 2 million dogs, cats and horses in the U.S. have been microchipped. There are almost 150,000 readers in the hands of veterinarians, rescue organizations, animal control officers, slaughter facilities and emergency management teams. Implanting the microchip only takes a minute or two and can be done at the same time as vaccinations or any other routine appointment. Your car has a Vehicle Identification Number that allows it to be tracked. Now, your horse can have a Horse Identification Number that does the same thing!